What could be better than savoring the taste of low-country cuisine from award-winning restaurants in Charleston? Enjoying them while enjoying a beautiful sunset over the Holy City, of course. 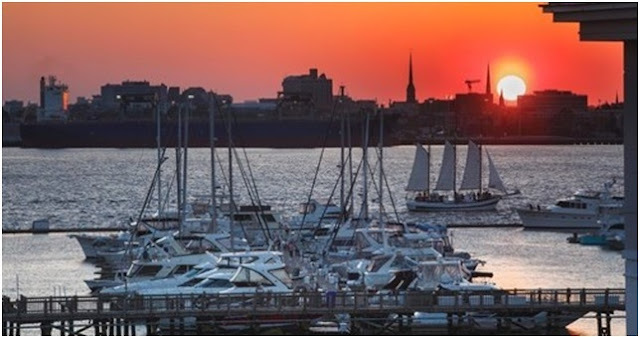 With its warm climate and gorgeous sunsets over the Charleston Harbor, you couldn’t ask for a more perfect place to wine, dine, and unwind. Here are the 10 best places to grab dinner while taking a sunset over the Holy City. Fleet Landing may seem like nothing special from the outside, but step inside its cozy interior, and you will quickly realize the appeal. With picturesque waterside views, a jolly atmosphere, and some of the best shrimp and grits in town, Fleet Landing will make it on your list of favorite places to dine. This popular restaurant stays packed, so make a reservation to guarantee a table and avoid the wait! If you’re on the Mount Pleasant side, be sure to stop by the Charleston Harbor Fish House. Named Best Water View Dining by Charleston Living Magazine in 2016, the Fish House is the only rooftop bar in Mount Pleasant that offers stunning views of the entire Charleston skyline, Ravenel Bridge, and U.S.S. Yorktown. Besides watching the sun go down over the Charleston Harbor, you can also enjoy the restaurant’s delicious seafood entrees such as their impeccable crab cakes and pan-seared swordfish. Grab a cocktail at the Bridge Bar on the roof and unwind as you take in one of the Holy City’s best views. You know that you’ve found a great place to eat when it’s a hotspot for locals and tourists alike. Bowens Island is a funky restaurant that you have to visit to understand its quirkiness. Located five miles from Folly Beach, Bowens is covered in graffiti, and guests are encouraged to sign their own names on the wall. The restaurant’s eclectic vibe is only part of its charm. 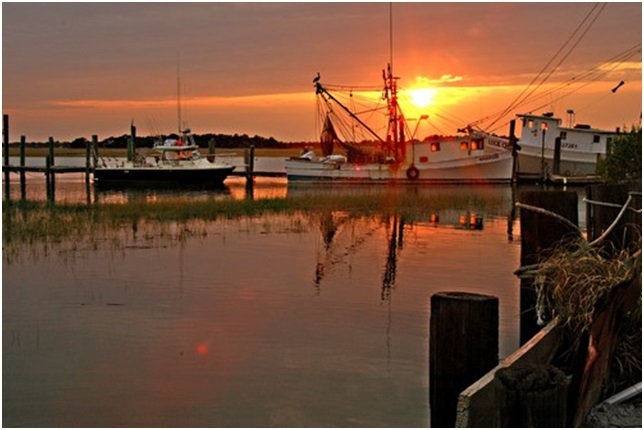 The delicious oysters, fried shrimp, Frogmore Stew, and other Lowcountry cuisine have been a local favorite for decades. To top it all off, Bowens has seating on the deck for guests to enjoy their meals while they watch the sun sink into the marsh. Whether you are a tourist or Charleston resident, this legendary eatery shouldn’t be missed. As if their breathtaking waterfront views weren’t enough, the Morgan Creek Grill on Isle of Palms has a superb offering of both upscale and casual dining menus featuring unbeatable Charleston cuisine. Whether you are going for brunch, a fancy dinner date, or simply want to have a drink while taking in the view, the Morgan Creek Grill is sure to please. Located at the Isle of Palms, the Morgan Creek Grill is a great place to find savory Lowcountry cuisine and listen to live music as you watch the sun set into the calm waters of the Charleston Harbor. Do you love art, incredible views, and colorful cocktails? If so, The Rooftop Bar at Vendue is calling your name. This rooftop bar is part of an art hotel which features interesting wall art and provides unique guest rooms for visitors. Even better, you don’t need to be a guest to enjoy the views and impressive bar menu on the rooftop! Go on a Sunday, and you will also hear live music that perfectly bends with this creative oasis by the water. For a casual dinner or a quick beer with friends, Salty Mike’s is a fun choice. Locals frequent this dive bar for its cheap, tasty drinks and the tranquil view of the marsh. This may not be your place for a romantic, fine-dining experience, but Salty Mike’s deserves your consideration for its wide array of beers on tap, juicy burgers, and stunning views of the ships and boats on the Ashley River. Inside the Grand Bohemian Hotel is Élevé, a quirky restaurant with an equally eclectic rooftop bar. Although many simply go for drinks on their fourth-floor rooftop, Élevé also offers serves Lowcountry cuisine with a French influence. The furniture and the décor of the outside bar area are part of Élevé’s appeal. With its glowing pink planters and shabby-chic furniture, Élevé is probably more suitable for younger crowds, but don’t let that stop you from enjoying their fantastic selection of wine. Are you craving Italian food? Coda Del Pesce is the place to go if you’re staying in the Isle of Palms. Unlike many so-called Italian restaurants, Coda Del Pesce offers an Italian-meets-seafood restaurant experience and provides an intimate atmosphere for special date nights. If you want a romantic dinner date with a view, Coda Del Pesce won’t disappoint. The cozy setting and calming views of the beach are amazing, whether you catch the sunset or not. From chicken strips to pasta and prime rib, California Dreaming has a menu that will please even the pickiest of eaters. For classic American fare, this restaurant is a winner. California Dreaming also has a wrap-around deck and patio that allows guests gorgeous views of the Ashley River. Do yourself a favor and save room for the New York Cheesecake! The prices of their cocktails aren’t cheap, but the Market Pavilion Rooftop Bar makes up for it in other ways. Not only does this bar have an impressive skyline view of Charleston, but its bar-side pool offers a respite from the blisteringly hot days in the Lowcountry. Market Pavilion Rooftop Bar is considered a high-end restaurant, so it’s great spot for a romantic dinner. However, with the amazing atmosphere, stunning views, and delicious cocktails, it is worth experiencing at least once. 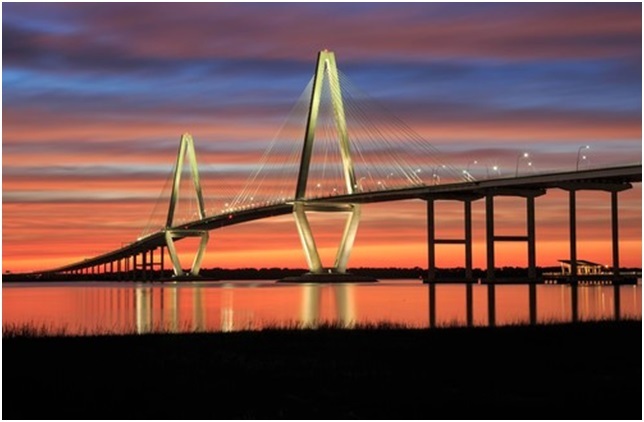 Charleston isn’t short on picturesque views. Whether you are a Charleston native or merely visiting this magnificent city, watching the sun set in the Holy City is a must. With ample venues to see the show, you will have plenty of opportunities to see why Charleston is such a special place.